Galaxies with active nuclei are similar to spiral galaxies. However, there are some large differences especially concerning the dynamics. The nucleus is typically much heavier than in spiral galaxies and pulls material from the galactic disc. This material is mainly sucked into a black hole in the centre. However, a smaller part of the material is thrown out into space at right angle to the disc. The material that is thrown out forms so called jets, which are at least one order of magnitude larger than the galaxy itself. 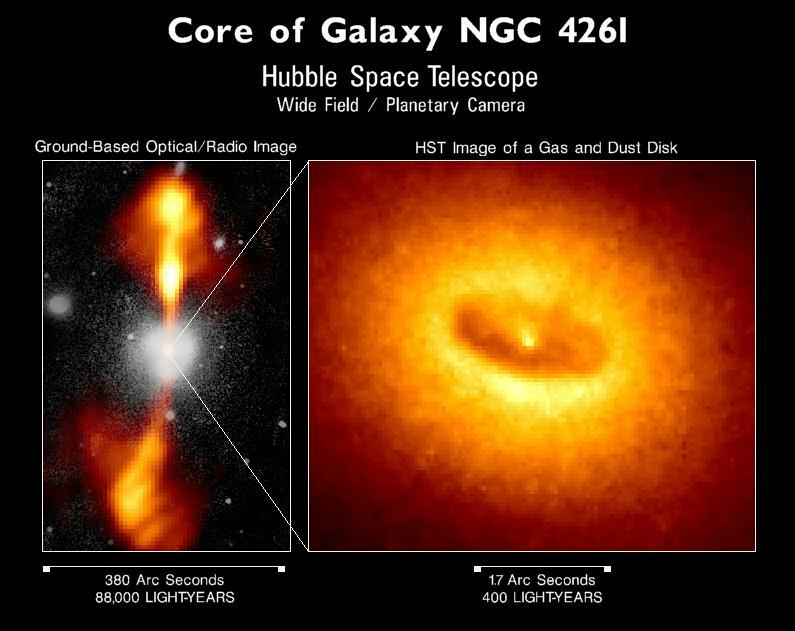 The amount of energy that is converted in active galactic nuclei is enormous. For example one has estimated that 1038 watt is generated in the form of radiation in the galaxy NGC6251. This power is the same as that generated by 1012 suns. Computer generated picture of NGC4261 based on observations of visible light and radiowaves. 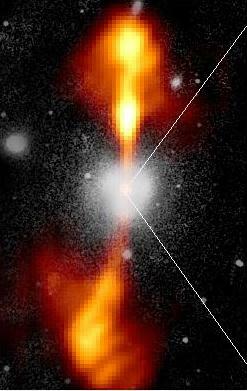 In the picture one can clearly see the lobes with emitted material (yellow) and the galaxy itself (white). This active galactic nucleus has also been observed by the Hubble space telescope. If you click on the picture you will see the central parts of NGC4261 from the Hubble space telescope.